Freebies like breakfast internet access and parking keep our guests coming back to the non-smoking La Quinta Inn Toledo Perrysburg. All 101 non-smoking rooms in the low-rise La Quinta Inn Toledo Perrysburg have coffeemakers cable TVs and free high-speed internet access. La Quinta's signature free breakfast offers a continental spread of make-your-own waffles hot and cold cereals pastries fresh fruit coffee and juice. There is a guest laundry facility on-site and the 24-hour front desk offers express checkout and fax and photocopy services. Pets are welcome and parking is available both for no extra charge. La Quinta Inn is off I-75 southwest of the Highway 20/Sandusky Street exit. 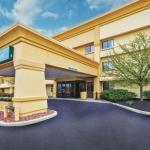 The hotel is one-and-a-half miles from downtown Perrysburg and 11 miles from the heart of Toledo. Perrysburg Marketplace Shopping Center is across the interstate one mile east of the hotel. Historic Fort Meigs State Memorial Park is 10 miles from the hotel. Toledo Express Airport is 17 miles away and Cleveland-Hopkins Airport is two hours away. Dogs of all sizes are allowed. There are no additional pet fees. Dogs may not be left unattended in the rooms except for a short time, and they must be leashed and cleaned up after.